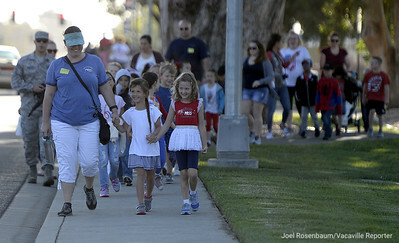 Studnets, teachers and volunteers from Scandia Elementary School walk along Travis Avenue on Travis Air Force Base toward the Airman and Family Readiness Center Tuesday during the 12th annual Remembrance Walk. 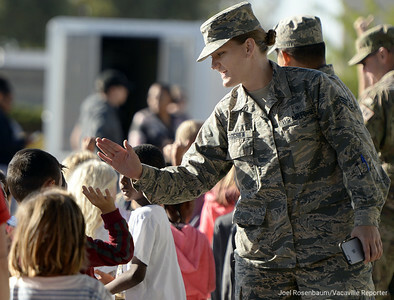 United States Air Force Senior Airman, Rebecca Berggen high-fives students from Scandia Elementary School Tuesday during the 12th annual Remembrance Walk. 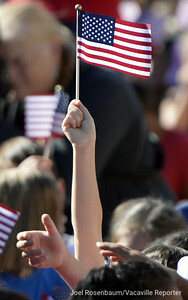 Studnets from Scandia Elementary School walk along Travis Avenue on Travis Air Force Base toward the Airman and Family Readiness Center Tuesday during the 12th annual Remembrance Walk. 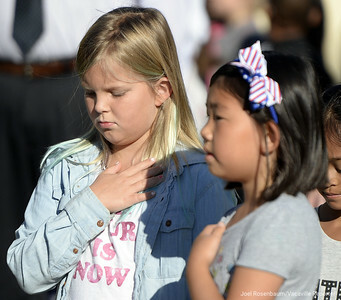 Scandia Elementary School third graders, Rylynn Eddelman, 9 (left) and Cayla Park 3 place their hand over their hearts as "Taps" is played over the base's public address system at 8:46 a.m to mark when the time when American Airlines Flight 11 crashed into the North Tower of he World Trade Center 9/11. Students from both Travis and Scandia elementary schools on Travis Air Force Base walked to remember and pay tribute to those that lost their lives during the 9/11 terrorists attack 17 years ago. 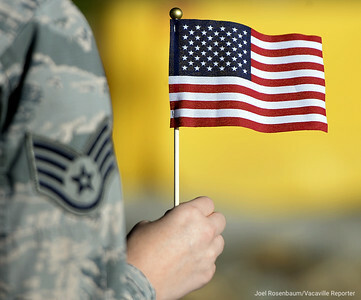 Members of the Travis Air Force Base Honor Guard preset the colors to begin a 9/11 ceremony at the Airman and Family Readiness Center Tuesday to remember and pay tribute to those that lost their lives during the 9/11 terrorists attack 17 years ago. 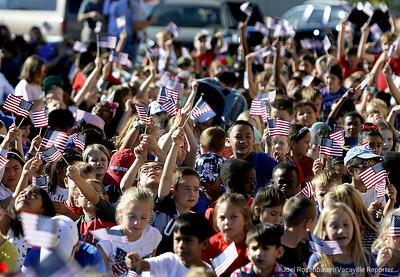 Nearly 1,000 students from Travis and Scandia Elementary School on Travis Air Force Base gather at the Airman and Family Readiness Center Tuesday to commemorate 9/11. 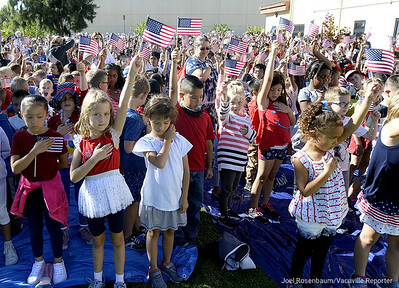 Students from Travis and Scandia Elementary School wave American Flags at the conclusion of 12th annual Remembrance Walk Tuesday at the Airman and Family Readiness Center at Travis Air Force Base. 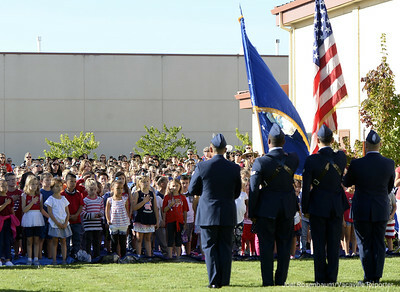 Elementary School students from both Scanda and Travis Elementary School on Travis Air Force Base wave American Flags as they stand while "Taps" is played over the base's public address system at 9:37 a.m. to mark when the time when American Airlines Flight 77 crashed into the Pentagon on 9/11. 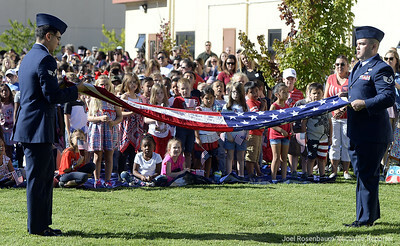 Members of the Travis AIr Force Base Honor guard perform a flag folding demonstration for students from Travis and Scandia Elementary School at the conclusion of a 9/11 ceremony Tuesday at the Airman and Family Readiness Center on base. Students began the ceremony by walking from their campuses to the center where they then sang patriotic songs, listened to classmates' poems. 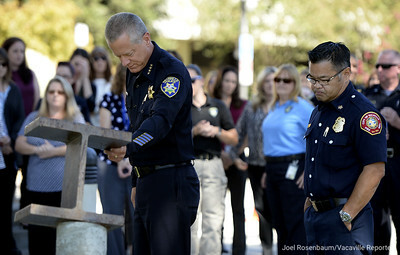 Vacaville Police Chief, John Carli places his hand upon the 9/11 Memorial after he and fire chief, Kris Concepcion (right) lead a small ceremony Tuesday in front of the police department. The memorial, an I-beam from the World Trade Center was dedicated in 2006. 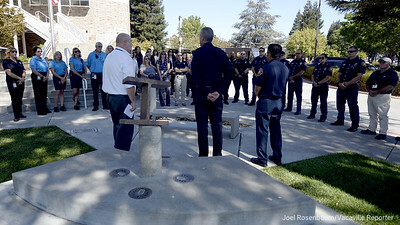 In Vacaville a small gathering was held at the city’s 9/11 Memorial right outside the steps of the police department. 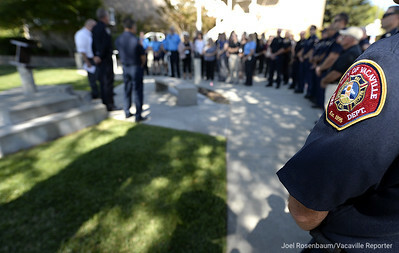 Police Chief John Carli and Fire Chief Kris Concepcion, along with members of the police and fire departments and city staff gathered for a moment of silence and to reflect on those who gave their lives. Vacaville Fire Department personnel (from left) firefighter/paramedic, Matt Moreno. 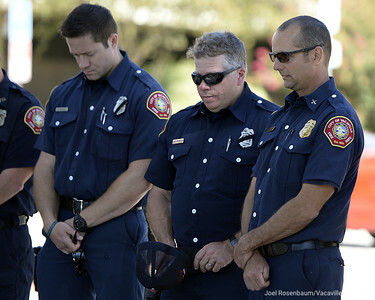 firefighter/engineer Tad Samolis and battalion chief, Alex Nourot bow their heads during a moment of silence at a 9/11 ceremony Tuesday held at the city’s 9/11 Memorial right outside the steps of the police department. Dedicated in May of 2006, the city of Vacaville's 9/11 memorial statue pays tribute to all the public safety personnel killed 17 years ago as well as those who continue to keep us safe. 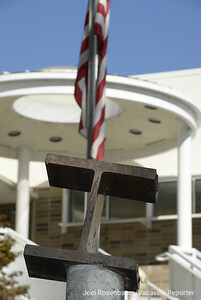 Crafted from a piece of steel from the Twin Towers the monument stands sentinel in front Vacaville Police Department.